Pipe lifting equipment makes it easier to handle pipes on site. With lifting equipment, an operator can lift and position pipe sections in a seamless motion. It improves productivity, as well as reducing the risk of accidents in the workplace. There are many types of pipe lifters on the market today. Two of the most commonly used ones are the toggle type and the spade type. They are simple tools that can do the job in a fast and efficient manner. One of the commonly used pipe lifters is the toggle type. Many companies opt for this lifter because it is easy to use. 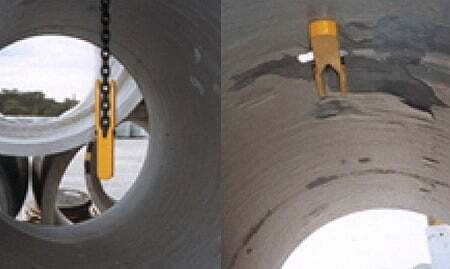 It is as simple as inserting it in a hole in the pipe wall and toggling the stopper perpendicular to the chain. The toggle type lifter typically has a working load limit of 2 tonnes. Its weight is 1.5 kg without the chain. As long as the weight of the pipe is less than the lifter’s working load limit then the lifting process should run smoothly and safely. The other pipe lifter we have to offer is the spade type. Just like the toggle type lifter you insert the tool into a hole in the pipe wall. Then you position the handle to the pipe’s end. The handle has a maximum length of 1 metre. We offer two types of spade type lifters. The difference between the two is their working load limit, which are 5 tonnes and 8 tonnes respectively. You can choose one based on your lifting needs. With lifting pipes, it is important that you know their weight to prevent the lifters from failing. To know more about our pipe lifting equipment for sale, call us today! Our staff can answer all your questions about pipe lifting and the appropriate equipment required for the job. All About Lifting & Safety are lifting and safety equipment specialists.